(Reuters) - Staples Inc (SPLS), the largest U.S. office supply retailer, reported lower-than-expected third-quarter sales, citing weak demand and a stronger dollar. The company, however, stuck to its full-year forecast, saying it was driving growth online and in new categories. 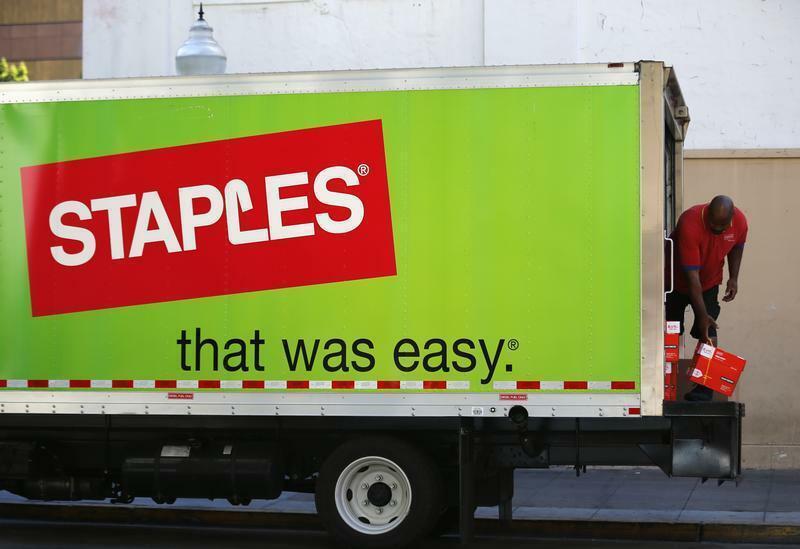 Staples, whose shares were up 1 percent before the bell, has been focusing more on tablets, breakroom supplies and copy and print services as demand wanes for traditional office supplies such as paper and toner. Office supply stores are also facing increasing competition from drugstores and mass merchants such as Wal-Mart Stores Inc (WMT.N) as well as from online retailers such as Amazon.com Inc (AMZN.O). Staples said its own online sales rose 3 percent in the quarter ended November 2 but it did not provide a revenue figure for the online business. The industry leader and its rivals have also been hurt by economic weakness in Europe that has hit sales to both corporate customers and individuals. Earlier this month, Office Depot Inc (ODP.N) closed a deal to buy OfficeMax Inc (OMX.N) but both reported third-quarter results that missed Wall Street's profit targets after a tepid back-to-school shopping season. Staples reported net earnings of $135.2 million, or 21 cents per share, for the third quarter ended November 2, compared with a loss of $596.2 million, or 89 cents per share, a year earlier. Excluding items, the company earned 42 cents per share from continuing operations, matching the average analyst forecast. Operating expenses fell 39 percent to $1.29 billion. The company closed 107 stores in North America and Europe in the 12 months up to the third quarter. The company had 2,215 stores as of February 2, according to its latest annual regulatory filing. Sales fell 4 percent to $6.11 billion. The stronger dollar reduced total sales growth by 1 percent, the company said on Wednesday. Analysts had expected revenue of $6.18 billion, according to Thomson Reuters I/B/E/S. Comparable store sales in North America, excluding sales through Staples.com, fell 3 percent, reflecting the same percentage decline in traffic and a flat average order size compared with the same quarter a year earlier. Staples maintained its full-year profit forecast of $1.21-$1.25 per share, saying it continued to expect sales to decrease in the low-single-digit percentage range. Analysts on average were expecting the company to earn $1.23 per share on sales of $23.37 billion. Staples shares were up 1 percent at $15.50 before the bell. They have risen about 35 percent since the start of the year.